Le Figuier is an old stone built cottage in the tiny hamlet of Gresignac. On the ground floor you’ll find a light and airy kitchen which is equipped with a gas cooker, fridge-freezer, microwave and espresso coffee maker, The kitchen leads on to a large living/dining room with French windows opening out on to a sunny terrace. A lobby leads to a comfortable sitting room with an open fireplace. Stairs from the lobby lead to a first floor bedroom with oak beams and whitewashed walls. There is a double bed and we provide all bed linen. A downstairs bathroom has a walk-in shower and we provide towels and hairdryers. There is a washing machine, tumble dryer, ironing board and iron. There is a LED TV with satellite system showing most English Freeview channels. There is wifi throughout the cottage. Outside there is a secluded terrace with a barbeque built in to an old fireplace, and a walled garden with a further terraced area and a pretty flower garden with the fig tree which gives the cottage its name. Guests are welcome to use the heated saltwater swimming pool at the owners’ nearby property. Gresignac is just minutes away from the large village of Verteillac with its boulangerie, butchers, general store and a choice of bars and restaurants. More bars, cafes and restaurants, plus high street shops and large supermarkets are in Riberac, a 20-minute drive away. 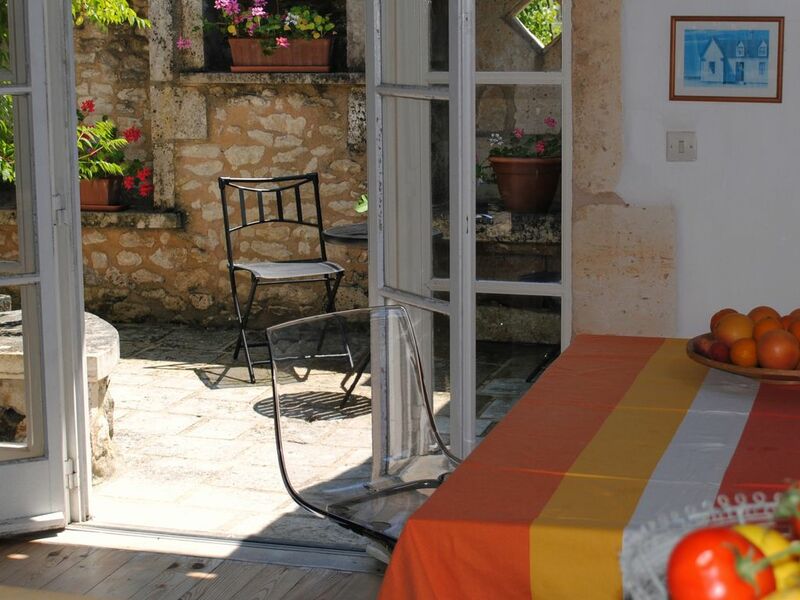 Le Figuier is an ideal retreat for two! We are Ed Passant and Liz Pearson and we live in Gresignac. We love the area and all it has to offer and we hope that everyone who stays at Le Figuier enjoys it as much as we do! There are electric heaters to the living areas, bedroom and bathroom. Duvet, pillows and bedlinen are provided. There is an automatic washing machine. There is a tumble dryer. Bathroom towels and kitchen tea towels are provided. There is a Jotul wood burning stove in the living / dining area. Logs can be provided. There is a sitting room with TV. There is a fridge freezer. There is an electric toaster. Basic pantry items are normally provided. The kitchen has a gas cooker, fridge-freezer, microwave, espresso coffee maker and toaster. Glassware, crockery and a good range of utensils are provided. The dining area adjoins the kitchen and opens out onto the sun terrace. Satellite system showing most English Freeview channels. There is a selection of books available. Cottage garden with lawned area and cottage garden. Kayaking and canoeing is available at several nearby locations. There is a secluded sun terrace. There are free tennis courts in nearby Cherval. There are golf courses at Angouleme and Perigeuex. Guests are welcome to use the heated, saltwater pool which is at the owners’ property nearby. Fantastic spot to unwind and slow down. Great area to explore. House has everything you could need. We felt very comfortable. Ed and Liz were lovely welcoming hosts and always on hand if things came up. Ed and Liz were very hospitable and helpful in answering our questions about the locality, whether to fill in gaps in the guide book, or recommend something - which we always agreed with when we got there. Beautiful, fantastically well-equipped house. Highlights for us included the courtyard, the bbq area, the kitchen and all the books and games - but we loved it all. Bernard, the baby barn owl in the barn opposite, was a bit of wildlife icing on the cake. Thank you to Liz and Ed for being such delightful, welcoming hosts. We had a lovely weeks holiday staying in the above property. The cottage was tastefully decorated and well equipped with everything one could possibly need. The cottage is in a very quaint hamlet in a beautiful area of France. Liz and Ed were very helpful and very welcoming. We would have no hesitation in recommending this property for a holiday. Le Figuier is located in the tiny hamlet of Gresignac in the Dordogne department of south-west France. There is a cottage garden and a secluded sunny terrace for outside eating. It’s a truly lovely spot! The nearest village is Cherval - a two-minute drive away or a pleasant half-hour walk. Here you’ll find a boulangerie for fresh bread croissants and pastries, a general store for everyday essentials and a bar-restaurant. Verteillac is a ten minute drive away and has several cafe-bars and restaurants as well as a boulangerie, butchers, general store, pharmacy and a bank with ATM. Market day is Saturday and a lively brocante is held on the first Sunday of every month. More bars and restaurants, plus independent shops and two big supermarkets are in Riberac, a twenty-minute drive away. On Friday mornings, Riberac also has one of the biggest markets in the region – perfect for fresh produce and regional specialities. Slightly further afield – but all within an hour’s drive – are several picturesque towns such as Brantome (the ‘Venice of the Perigord’) and Bourdeilles and Aubeterre sur Dronne, as well the lovely cities of Angouleme and Perigueux with their quaint old towns as well as modern retail centres.